Woohoo! Domino is coming back! Okay, so it's only scheduled for one special "Quick Fixes" edition in April and an as-yet-unspecified edition in the fall, but it's a start. 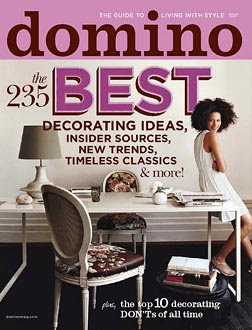 I loved Domino—when I lived in a studio that was far too small for two of us, when I lived with a roommate and many cockroaches, even when I lived in the dorms in college, I subscribed to Domino. So many good ideas and sources of inspiration. And it didn't seem all poncey and pretentious the way so many design mags do, you know? So yeah, I'm excited. Details to come here.